My mother used to make large trays of delicious halva. 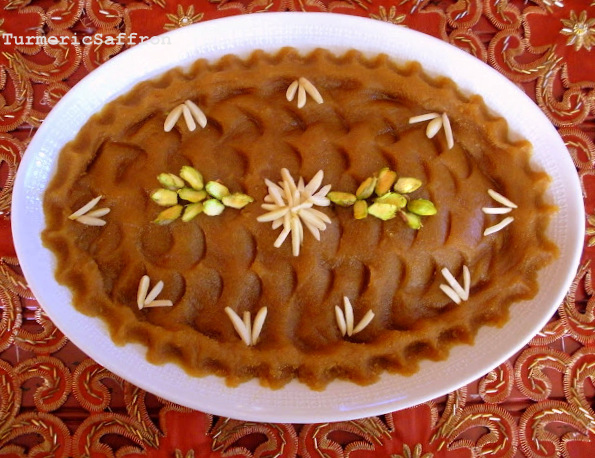 حلوا - Halva is made with wheat flour, butter, sugar and rosewater. In Iran, halva is usually made during religious holidays and served after the funeral services. I, on the other hand, think that you don't need a special occasion to make halva. 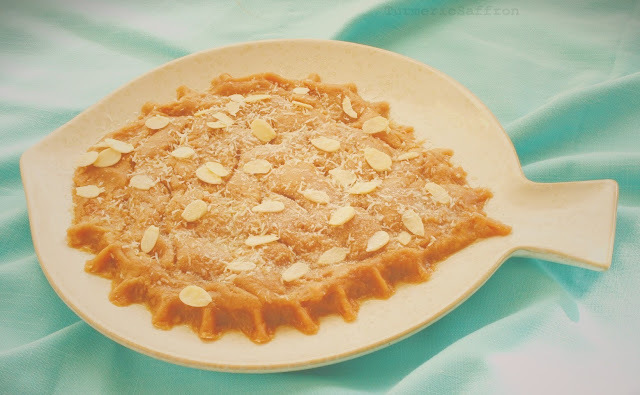 Halva is a very rich and fulfilling dessert. You can make it ahead and freeze the leftovers for later. It keeps well in the freezer. Combine the sugar and water in a medium saucepan over medium heat. Bring to a gentle boil, add the cardamom, saffron and the rosewater. Remove from the heat, set aside. Place a heavy-bottom pan over medium-low heat and lightly toast the flour for 8-10 minutes, until you smell the aroma. Stirring frequently. Add the oil and stir continuously for about 10-12 minutes over low heat. While stirring, gradually pour the sugar syrup into the pan, until it is fully absorbed and the halva has thickened. Remove from the heat and transfer the halva onto a serving platter. 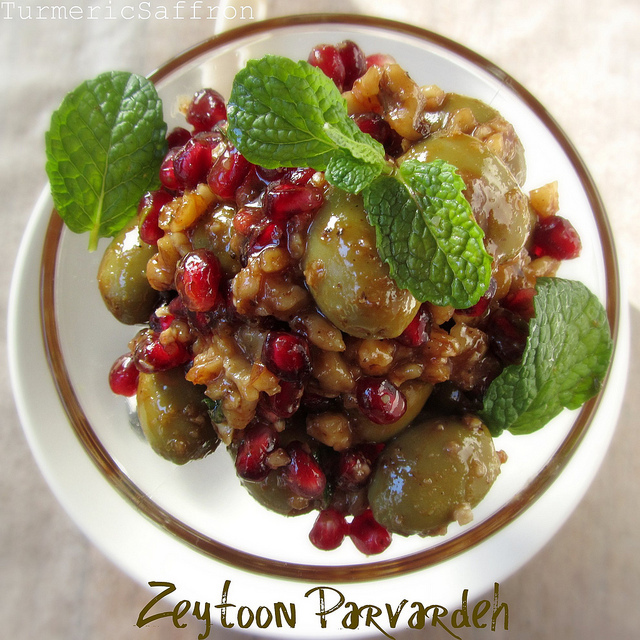 With the back of a spoon flatten the halva and garnish with the desired toppings. This is a childhood favourite and also how I can get fat very fast! So I just want to make sure I'm not misunderstanding; in the first step, you boil only 1 cup of water and then you had the remaining 1/2 cup of water, in addition to the sugar mixture, to the flour in step 4, right? By the way, do most Iranians like halva? I'm thinking of making it for someone I know who is Iranian, and I'm hoping that they'll like it! I made the necessary changes in the recipe. Yes, most Iranians like halva. Thank you! Thank you so much! Also one last question; what kind of sugar do you yourself use? The sugar I use is an organic cane sugar and it's not as fine as granulated white sugar. Does it matter which one I use? I use granulated white sugar. You can use organic cane sugar. It doesn't matter which one you use. Salam Azita, I love your blog! I made halva and it turned out yellow and not brown. Can you please tell me what I could have done wrong? Thank you very much. Salam, thank you! For this recipe use whole-wheat flour and toast it lightly before adding the butter. Yes, you can use coconut sugar instead of cane sugar and you can use coconut flour instead of wheat/all-purpose flour. The texture might be a little dry and dense. I have a question: do you have the recipe of kookoo e shirin? I can't fid it. Salaam Azita, hal-e shoma chetore? You're recipe for halva was extremely useful as I wanted to replicate my mother's recipe. Do you know the recipe for koofteh berenji? Thank you for your help and khoda hafez! You can leave out the cardamom.